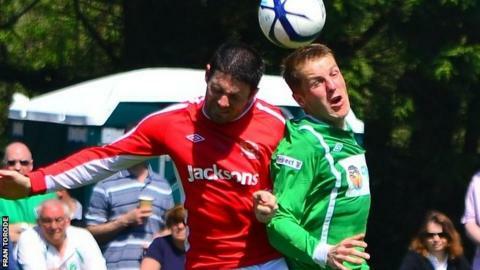 Jersey will play French fourth-tier side Union Sportive St Malo in a friendly on Sunday, 4 January. Springfield Stadium is being redeveloped for next year's Island Games, so the match will be at St Brelade FC with a 13:00 GMT kick-off. "They'll be an extremely tough game for us," said the JFA's Iain MacKenzie. St Malo are 10th in Group D of the French Amateur Championship (CFA), with the winners of the four regional groups promoted to the professional third tier of French football. "They [St Malo] have brought in five new players and with that number of players it takes them time to understand the tactics that they want to play so their focus is on next year," MacKenzie told BBC Sport. "They're hoping to push into the national professional leagues." "I am delighted with this fixture and I am looking forward to the game and 2015 in general with the Muratti and Island Games coming up and the new 3G pitch getting laid," said island manager Jimmy Reilly. "It is exciting times for the players, the JFA and the Jersey public. This is a really good match to get us started for the season ahead and I expect a very difficult game against what will be quality opposition."